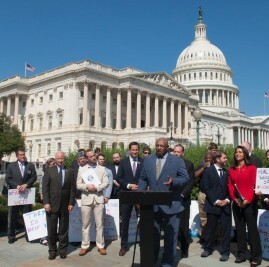 NVCLR CoFounder speaking on the Capitol to support the Fairness for Veterans Coalition. The NVCLR is a Connecticut-based organization committed to providing veterans with social, legal, and technical assistance including help with meals, housing, and benefits. NVCLR is particularly interested in upgrading the discharge statuses of veterans who received less than honorable discharges.